I have a friend that recently found out she was allergic to eggs. I had been planning to make mini quiches (that may still be a future post) for a brunch get together, but decided that I wanted to make a dish that I knew she could eat without breaking into hives. Jillian, thanks for being an inspiration for new recipes 😉 I was originally contemplating a root vegetable hash and then thought maybe I’d try something totally different – how about sweet and savory root vegetable pancakes with sweet potato and rutabaga? And so it was. 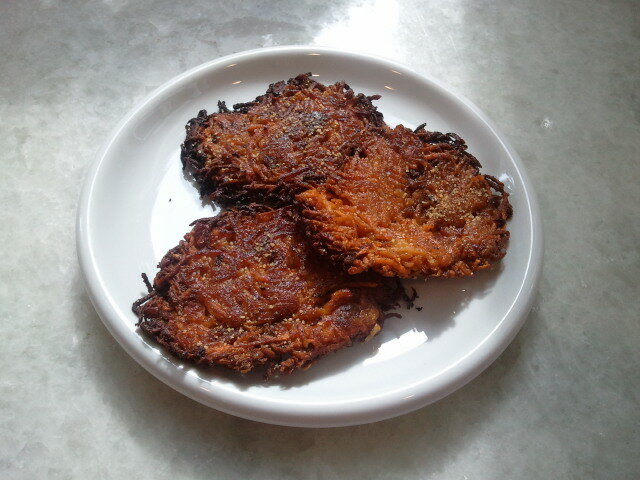 The challenge here was to make them gluten and egg free, two ingredients that most potato pancake recipes have in them. I actually made half of them without egg and the other half with egg, so really it’s your call. I admit that the egg containing pancakes stay together better (but that isn’t really a surprise is it?). You might ask, why sweet potato and rutabaga? I’ll retort with “Why not? !” The sweet potato will caramelize and sweeten as cooked. The rutabaga has a turnip-like smell, but similar to turnips or radishes, will pick up the flavor of the food it’s being cooked with so it’s not overwhelming, or even noticeable once pan fried. The rutabaga is a yellow turnip that stemmed from a cross between a cabbage and a turnip. They are not uncommon in Scandinavian, English and Scottish fare, often served mashed or in stews. I sometimes use rutabaga in a root vegetable hash or even just as fries; one medium rutabaga is about half the calories and carbs of a sweet potato. 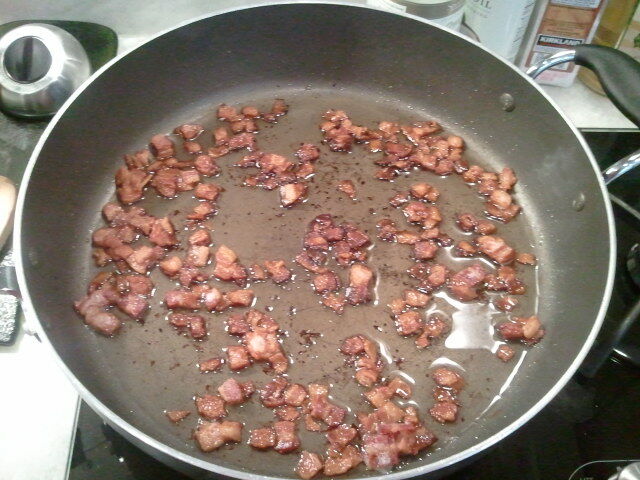 First, dice the bacon and cook on low heat until all pieces are crisped. Once the bacon is done cooking, place it on a paper towel to soak up the oil and crisp. Leave the rendered bacon fat in the pan. Use a slotted spoon to sieve out any leftover bits. 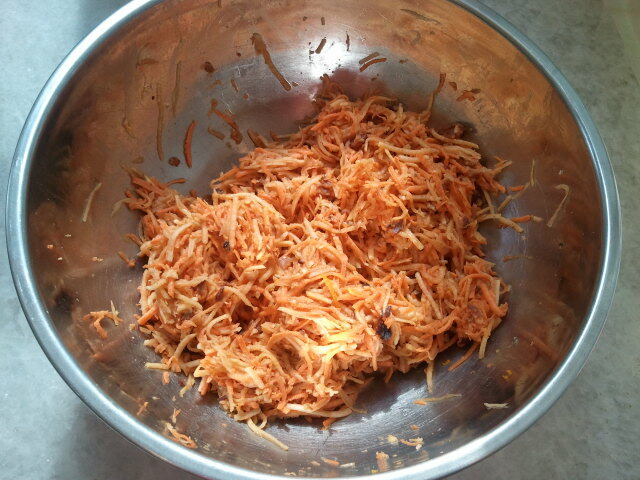 Now, for the next part, using a food processor with the fine grating setting works quickly and efficiently. If you don’t have one, a regular grater will do. 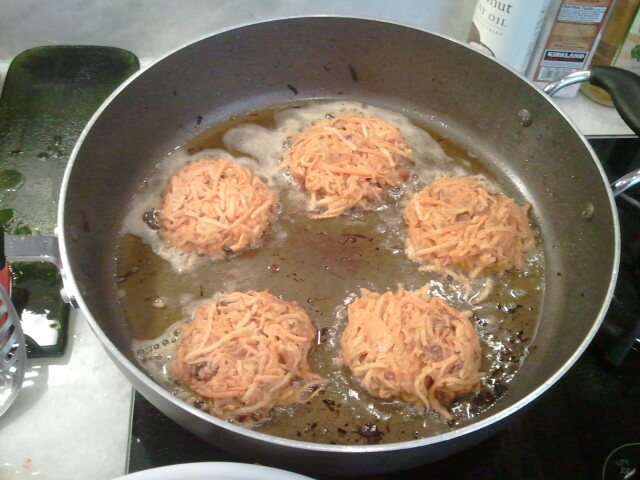 Grate the sweet potato, rutabaga, and onion. 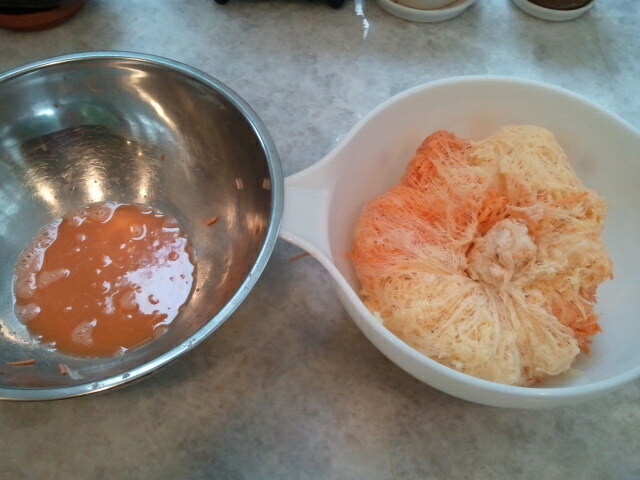 Place a piece of cheesecloth into the bottom of a very large bowl. Add the sweet potato, rutabaga and onion to the bowl. Now, bundle up the mixture into the cheesecloth and squeeze the crap out of it to remove moisture – I ended up with about 1 cup of liquid after this step. Make sure the ingredients are fairly well mixed. 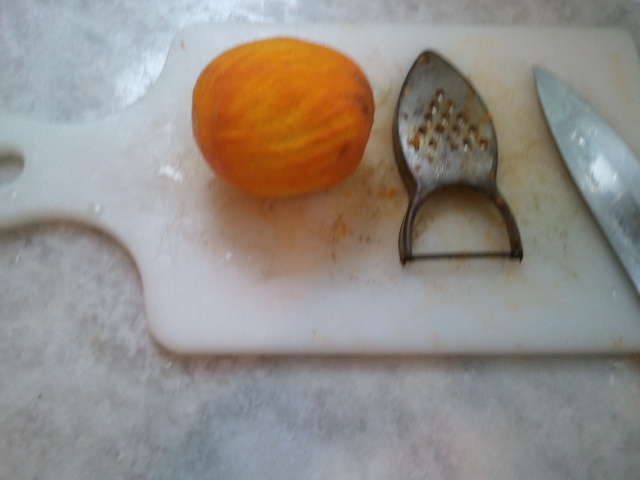 Now, zest an orange directly into the bowl. After this, add the spices and maple syrup and mix well (by hand). In a small bowl, combine your binding mixture (with or without egg) and whisk lightly; you want to make sure that you don’t have any tapioca flour clumps lingering. Add the binding mixture to your large bowl and mix well (by hand) again. 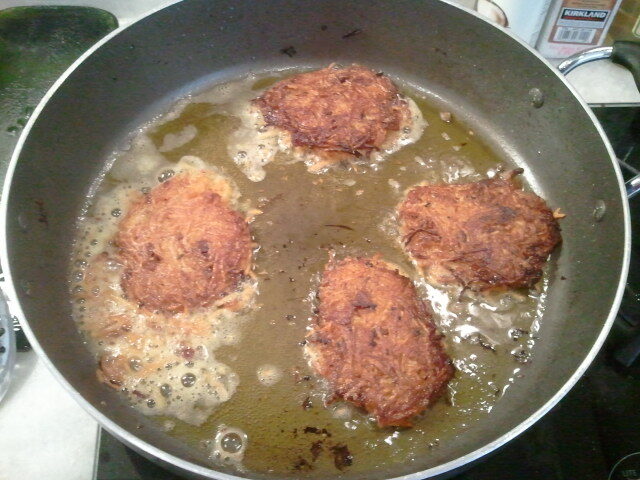 Finally, add the bacon bits to the “batter”, crumbling them into smaller pieces with your hands as you add them. Heat the coconut oil in a large frying pan on low-medium heat. When you add a drop of water to pan and it sizzles, the oil is ready for frying. Why is this important? Because you want the pancakes to brown nicely. 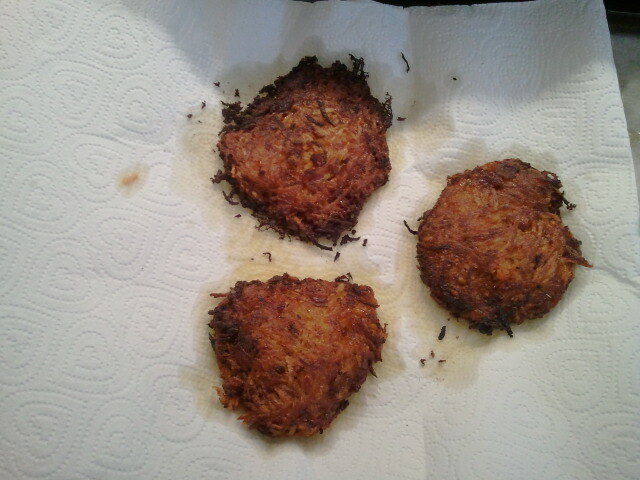 Make small patties (palm sized) and drop them into the frying pan. Flatten with a spatula. Cook for five minutes and then flip carefully – I actually used two spatulas (especially with the no egg pancakes) to ensure that the pancakes stay in one piece. Cook for another five minutes and then transfer to a paper towel. This allows the pancakes to “set” (i.e. stay in one piece) and reduces the oil content. The pancakes should firm up a bit after resting for 5-10 minutes. Dust the pancakes with ground cloves and maple sugar crystals. And viola! This entry was posted in appetizer, breakfast, pork, snack and tagged bacon, maple syrup, orange zest, pancakes, rutabaga, sweet potato. Bookmark the permalink. They were awesome! A very enjoyable egg free experience.